These notices shall satisfy three separate but related procedural requirements for activities to be undertaken by Rockingham County Per 24 CFR 58.33 and 24 CFR 55.20(b)(1), the combined Notice of Finding of No Significant Impact and Notice of Intent to Request Release of Funds (FONSI/NOI-RROF), and the Notice and Public Explanation of a Proposed Activity near a wetland will be published simultaneously with the submission of the Request of Release of Funds (RROF) . The comment periods for the FONSI/NOI- RROF, Explanation of a Proposed Activity in near a wetland and RROF have been combined. REQUEST FOR RELEASE OF FUNDS: On or about May 11, 2018, Rockingham County will request CDFA/CDBG to release CDBG Program Funds for the proposed following activities: $500,000+/- in CDBG funds. The County will retain $17,000+/- for administrative costs and to subgrant $483,000+/- to CEDC/REDC. CEDC/REDC will retain $10,000+/- for loan servicing costs and loan $473,000+/- to Northwoods Brewing Co., LLC / Johnson’s Restaurant for working capital/equipment for their new event space. As a part of this project, Northwoods Brewing Co., LLC /Johnson’s will be creating a minimum of 25 jobs that will primarily be available to low and moderate income persons. The project is located near a wetland. CDBG Funds: $500,000. Other Funds $500,000+/- Total Project Cost: $1,000,000+/-. FINDING OF NO SIGNIFICANT IMPACT: Rockingham County has determined that the project will have no significant impact on the human environment. This determination is based on the assumption that the Northwoods Brewing Co., LLC/Johnson’s will obtain all permits required, and will adhere to all applicable regulations. Therefore, an Environmental Impact Statement under the National Environmental Policy Act of 1969 (NEPA) is not required. Additional project information is contained in the Environmental Review Record (ERR) on file at Rockingham County, 119 North Road, Brentwood, NH 03833 and may be examined or copied weekdays 9 A.M. to 4 P.M.
PUBLIC EXPLANATION OF A PROPOSED ACTIVITY NEAR A WETLAND: This is to give notice that Rockingham County conducted an evaluation as required by Executive Order 11990, in accordance with HUD regulations at 24 CFR 55.20 Subpart C Procedures for Making Determinations on Wetlands Protection. The activity may be funded under the Community Development Block Grant (CDBG) under Title I of the Housing and Community Development Act of 1974 (PL 93-383), the National Affordable Housing Act, as amended. The proposed project is an expansion project of the existing Johnson’s Restaurant to include a brewery and event center located on an approximately 14.55-acre site at 1334 First NH Turnpike Northwood, NH. The subject property includes one wetland that comprises approximately 0.77 acres. A sewer pipe will run underneath the wetland, using horizontal drilling techniques, so that no direct or indirect impacts to the wetland or its 50 foot buffer are anticipated. Rockingham County considered alternatives and mitigation measures to the proposed project to minimize adverse impacts and to preserve natural and beneficial values of the on-site wetland. One alternative considered was to excavate a traditional trench through the wetland to get to the leachfields but this was rejected because of the potential significant impacts to the wetland. A second alternative considered was to undergo the project without the use of federal funding. This alternative was initially selected, and work began under this plan. However, as cost overruns mounted it was clear that there were going to be future funding gaps and was clear that Federal funding sources needed to be considered. For this reason this alternative was dismissed. Finally, though not considered to be feasible, one option would have been to repair the existing septic system to reverse the early stages of failure. This option was not considered since it was determined early on that the current leach field would still be suitable solely for wastewater generated in the brewery, while sewage would be managed separately in a new septic system. Rockingham County has reevaluated the alternatives to the proposed work near the wetland and have determined that it has no practicable alternative. Environmental files that document compliance with steps 3 through 6 of Executive Order 11990, are available for public inspection, review and copying upon request at the times and location delineated in the last paragraph of this notice for receipt of comments. RELEASE OF FUNDS: Kevin Coyle certifies to CDFA/CDBG that in his capacity as Chairman, Rockingham County Commissioners, he consents to accept the jurisdiction of the Federal Courts if an action is brought to enforce responsibilities in relation to the environmental review process and that these responsibilities have been satisfied. CDFA/CDBG’s approval of the certification satisfies its responsibilities under NEPA and related laws and authorities, and allows Rockingham County to use Program funds. 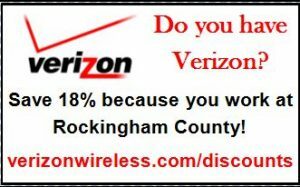 PLEASE BE ADVISED: Rockingham County is aware of many telephone scams going around, in which individuals are claiming to be Rockingham County officials or employees. Some of these scams involve claiming the victim has missed jury duty and has a warrant out for arrest, or is due to be served some other court warrant or paperwork. Other scams have included the individual claiming to be from the IRS and telling the victim they owe money. Most of these calls are designed to scam the victim out of money or information that can lead to identity theft. We urge the residents of Rockingham County to exercise extreme caution in releasing any personal information over the phone. Rockingham County officials and employees will never call you requesting this information. If you receive a suspicious call from someone claiming to be from one of our departments, please call the number for the department listed on our Contact Us page to verify. The Rockingham County’s Sheriff’s Office has also provided this press release with additional helpful tips. Have you been contacted by someone claiming you are owed money by Rockingham County, and asking you to sign a contract or pay a fee to recover the “unclaimed money?” There has been a rise in unclaimed property scams recently, and while some are legal companies, it is never necessary to pay a company to “find” or “collect” money that is owed to you by a government agency.